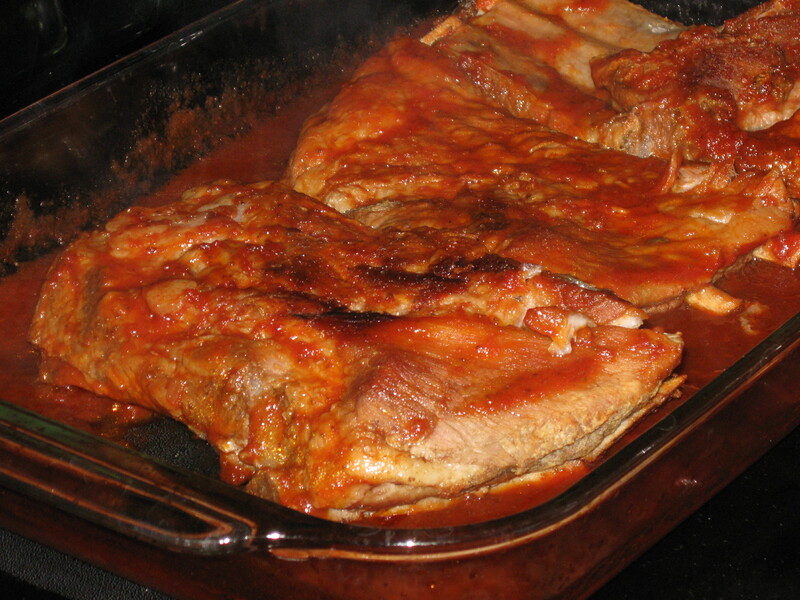 I don’t know what it is – I LOVE tinkering with ribs and my family loves eating them. All of you will be emailing me your thanks after one taste. One year I made these for Easter and nobody missed the traditional ham. Get out a large pot and place the ribs into it (you will probably have to slice them into small slabs) then fill pot with cold water to cover. Add 1 cup cider vinegar to the water, bring to a boil then cover slightly and simmer for one hour, stirring them once in a while. Half-way through simmering time, preheat your oven to 325 degrees, and get ready 2 baking pans with at least 2″ sides; position your oven racks to accomodate these 2 pans. Now make the sauce. . .
Place all the sauce ingredients into a large bowl, whisk well to combine then spread half into each of pans. When simmering is completed, using tongs, remove the ribs and divide between the 2 pans, turning ribs to coat completely in the sauce. 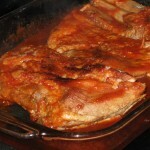 Place in the oven – uncovered – for 30 minutes; turn the ribs, alternate pans in the oven, then cook 30 minutes longer.